He knows everything about you – including the first place you’ll hide. On a warm summer night in one of Boston’s working-class neighborhoods, an unthinkable crime has been committed: Four members of a family have been brutally murdered. The father – and possible suspect – now lies clinging to life in the ICU. Murder – suicide? Or something worse? Veteran police detective D. D. Warren is certain of only one thing: There’s more to this case than meets the eye. Danielle Burton is a survivor, a dedicated nurse whose passion is to help children at a locked-down pediatric psych ward. But she remains haunted by a family tragedy that shattered her life nearly twenty-five years ago. The dark anniversary is approaching, and when D. D. Warren and her partner show up at the facility, Danielle immediately realizes: It has started again. A devoted mother, Victoria Oliver has a hard time remembering what normalcy is like. But she will do anything to ensure that her troubled son has some semblance of a childhood. She will love him no matter what. Nurture him. Keep him safe. Protect him. Even when the threat comes from within her own house. In New York Times bestselling author Lisa Gardner’s most compelling work of suspense to date, the lives of these three women unfold and connect in unexpected ways, as sins from the past emerge – and stunning secrets reveal just how tightly blood ties can bind. Sometimes the most devastating crimes are the ones closest to home. "Boston police detective D. D. Warren returns in another gripping thriller. . .In addition to telling a compelling story, Gardner also explores an issue that is rarely discussed in fiction: children who are psychotic. Gardner never sensationalizes her story, and the book ends with a resolution that is creatively and emotionally appropriate. An excellent novel." "Gardner has another hit on her hands." 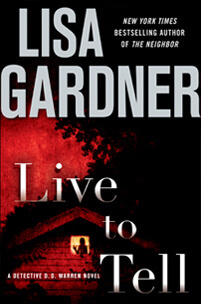 "The lives of three women collide in Gardner’s amazingly chilling new thriller. . . The devastating, sometimes tragic consequences of childhood mental illness are the backdrop for this electrifying tale of murder and family secrets." ". . .Live to Tell explores a bevy of social issues, serving as a reminder that horrors are just as present in everyday life as they are between the pages of a book." "The characters of Victoria, Evan and Danielle’s young charges will linger with you, leaving you thinking about the rough hand some children are dealt." "Gardner does a marvelous job at building the story like a home. The readers enter, working their way through the chapters, only to find that those chapters, like a home, open new doors with passages that lead elsewhere. Even though readers may feel they have it all figured out, Gardner is full of surprises." "Someone is killing entire families and staging the murder scenes to make it appear as if each father killed his family before killing himself. An utterly gripping if profoundly uncomfortable story that could cause sleepless nights."